Make Noise have just released the new version of Rene – an update to the original Rene from 2009, which, according to Modular Grid, is the most popular Eurorack sequencer and one of the most popular eurorack modules overall. The original Rene introduced the concept of Cartesian, or X/Y, or GRID based sequencing, which is a method of sequencing, where rather than going through steps sequentially, as is done in traditional sequencers, you can go back and forth, up, down, left or right, or in any angle or number of steps, and in any direction on a grid of locations. The new version of Rene expands on this concept in multiple different ways, but probably the most striking one is that it literally goes deeper – letting you travel in any direction not just down up, left and right but also in and out, in a third dimension. Rene 2 also adds two more additional channels for a total of three – X, Y and C, and a few more things we’ll cover below. Sequencing in three dimensions might be a little confusing, so a simpler way to look at it is that rather than having just one set of grids, which Make Noise call STATES, you have 64 of them, and you can seamlessly jump from one state to the other any time you want, mid sequence. Before we dive into the third or Z dimension or moving between states, let’s look at what a basic state contains. Each state has three different channels RED X, GREEN Y and ORANGE C. In each channel you can jump around between up to 16 different locations. Each location can store either quantized notes or continuous voltage levels, controlled by individual knobs on the CV knob grid. In addition, you can set on/off positions for location, glide and gate triggers on a per location basis on the PAGE grid on the right side of the module. Of the three, X and Y are completely independent, whereas channel C is a Cartesian derivative of channels X and Y. X and Y can each have their own clock, quantized scales, length and so on. Movement from location to location is either manual in Latch mode, or in what MAKE NOISE calls Snake patterns, which means that despite the fact that they’re arranged in a grid, you move between the locations using only one dimension of movement, either forward or backward, just in one of 16 different snake patterns. Some of these patterns indeed look like a snake is walking around your grid, and others are less organized jump between the various locations on the grid. Basic movement between the locations on channels X and Y is done by sending triggers into the XCLK and YCLK inputs, but you also have more advanced movement options using the XMOD, XCV, YMOD and YCV inputs, so while by default snake patterns in channels X and Y set a singular linear path, you can jump and skip back and forth around quite easily using the MOD and CV inputs. MOD inputs accept Gates and CV inputs accept a range of control voltages. Both MOD and CV inputs have different functions based on one of four options in the FUN or FUNction page. These are covered more in depth below and in the accompanying video. The third channel, the Cartesian channel – doesn’t have any CLOCK, MOD or CV inputs of its own. It also can’t move in one of the 16 snake patterns. Rather, its motion is derived from the X and Y channels. It moves on the X axis following the X channel’s clock, and on the Y axis follow the inputs on Channel Y. All the X and Y channel mods apply to the C channel as well. Each of the 3 channels, X Y and C output Voltage and Gate. Voltage can be quantized to any scale you want, or not quantized at all, and gates and slides can be programmed individually. So with that we covered all of the inputs and outputs except the Z Axis – which controls movement between states. Before I show you how that works, let’s talk about the different channel pages configuration pages. Each of the channels has a few different pages or views that allow you to control various aspects of its performance. These are Access, Gate, Glide, Snake – which is the only view that doesn’t apply to channel C, FUN or FUNction, Quantization control, and if you re-tap a channel button once it’s selected, you get one extra view or control page – which is Latch Mode. ACCESS: This page defines which of the locations on the CV Grid are active. If you turn off a location in the Page Grid, that location will be skipped – which is an easy way to reduce the number of steps in your sequence. Rene 2 has another way to treat non-access enabled steps by activating a “FUN” setting called Sleep Mode, where the access-disable steps are still included as part of the pattern CV changes in those locations aren’t applied. GATE: The Gate page also represent the locations on the CV grid, only this time turning off a location will only disable its GATE signal. If that location contains a different CV than the previous location, that will still be sent out the CV OUT. GLIDE: The Glide page lets you activate a glide or slew so that the voltage change for that location is smooth rather than abrupt. SNAKE: The Snake page lets you define one of 16 routes through the grid locations. As I mentioned before, this applies only to channels X and Y. Channel C moves along a Cartesian path based on the X and Y channel motions. FUN: The FUN or FUNction page lets you toggle various settings using the top three rows of the Page Grid. Labels tell you what each toggle controls. The FUN.MOD row determines how Rene 2 treats gates coming in the MOD input: whether a gate will reset the sequence, add another clock step, run or stop the sequence, or change its direction. The FUN.CV row controls how Rene 2 treats voltages coming in the XCV/YCV inputs: whether CV will transpose or add voltage to a sequence, sweep through the locations, determine the active snake pattern, or activate Sample and Hold mode – which is similar to the Add option, but it applies the Added voltage only upon detecting a rising edge voltage from the MOD input. The FUN.OP row contains general channel options: the Sleep option is a Sleep Mode toggle, the Trig option will replace a gate signal from the clock with a trigger; and Scan lets you load all the actual physical knob positions into the current channel. Normally when you swap a pattern the stored knob positions are loaded from memory, so the physical knob positions don’t represent the actual pattern values. Scan loads the actual knob positions into the current channel and overwrites the previously stored positions. The Cartesian channel inherits its X and Y motion from the X and Y channels, so the FUN.MOD and FUN.CV rows are inactive for channel C.
QUANT: Quantization is the last page on this list. This page lets you enable quantization and choose whether it will be applied to 1, 2, 3 or 4 octaves. You can also select which of the 12 semitones are be included or excluded from the active channel. LATCH: Finally the last page mode is Latch Mode – which is sort of like an alternative ACCESS and GATE PAGE combined. You re-tap a selected channel button to enter the Latch Page. You know you’re there because all the Page Indicators light up. Now you’re ready to select which locations become latched. Once you select one, the Channel light starts blinking quickly to indicate that Latch Mode is active. You can still toggle back to see the various configuration pages, but only the steps you latched will be active as long as at least one latch location is active. You can also use Latch Mode to play Rene 2 like an instrument when the pattern isn’t running or to quickly edit and preview the sound or modulation on specific locations. A final trick up Latch Mode’s sleeve is that it works across states… which leads us nicely into precisely that topic. Everything we’ve covered up to now – the three channels and all of their page configurations – all that is one Rene 2 “State”. Rene 2’s biggest innovation is the ability to store and seamless move between 64 of these states, literally adding a third dimension to each of the grid, on each of its three channels – 64 steps deep. The Y State Page is Select Mode, and lets you select, activate and deactivate any one of the 64 different states. The Z-MOD gate input, and Z-CV input will only cycle through active states as selected in the Y State Select Page, and will skip over the disabled ones. The C page button represents Global options, where you can save all 64 states to static memory, activate Select Bus control to change presets on other Global Bus compatible modules such as Tempi and Disting MK4, and couple of other options as described in the accompanying video. PROS: Clearly something made the original Rene the most popular Eurorack sequencer, and this new version improves on it in a number of significant ways – the extra two channels, the 64 states, per step glide and more, just make it a completely different beast. Rene 2 will have you sequencing in ways you never imagined, and is a treat to explore and experiment with. CONS: Rene is a different kind of sequencer, so you may not find things available in more “traditional” ones like MIDI connectivity or polyphonic support, but then on the other hand, with the risk of generalizing “regular” sequencers will probably lack the flexible sequencing features of even the original Rene, not to mention the 3 dimensional ones of Rene 2… Top on my wishlist is the ability to seamlessly chain states regardless of the number of steps per state – currently you can create patterns that are more than 16 steps long, but you need to be proactive about timing State changes to do that. Another thing I’d like to see if possible is a faster response when you touch the control grid. Currently if you swipe too fast not all the grid elements will register, it’s not that big of a deal once you get used to it, but you do need to be aware of it to avoid non registered taps. 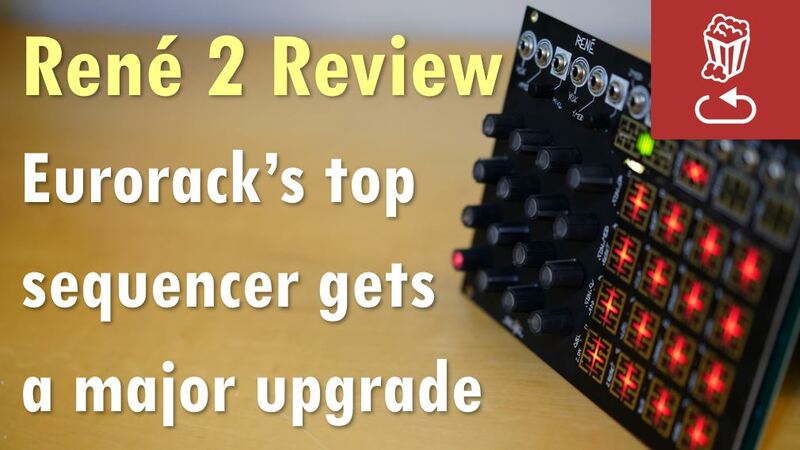 Rene 2 is a very worthwhile upgrade to the original Rene – this isn’t just a small version change with a few minor new features. The new Rene is a significant departure from its successful predecessor, and very much for the better. Next Post: Novation SL MK3 Review: Is it a game-changing controller?